The Old House for up to 4 persons. The Round House for up to 4 persons. Villa Dusett , ideal for families, is a lovely 3 house property for up to 10 persons in Castellaras. 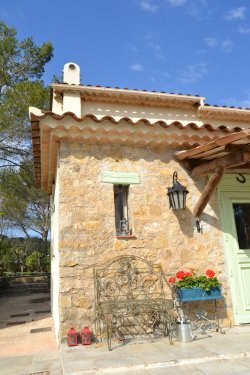 The property is always rented out to one party of guests, but You can decide if You want to pay for and use all 3 houses for 10 persons i.e 3 295 Euro for one week in high season or only pay for and use i.e. the Round House for 4 persons during one week for 1 975 Euro during high season. For questions and reservations pls. e-mail info@dusett.fr. Villa Dusett is situated in the historic heart and most colorful parts of the French Riviera. In one day You can combine a kaleidoscope of holidays. Morning starts by breakfast in the tranquility by the heated pool and then You go shopping down the glamorous Rue d�Antibes in Cannes, followed by a spot of sunbathing on the beach at Juan les Pins. Enjoy a gastronomic lunch in the hilltop village of Mougins or go to 1 of the 7 nearby golf courses. Then visit the perfume houses of Grasse in the afternoon before driving through the spectacular gorge of the river Loup ending up for cocktails on the panoramic terrace of Gourdon castle. Tired but fulfilled, You return for a delicious Provencal dinner on the Place des Arcades in Valbonne village. 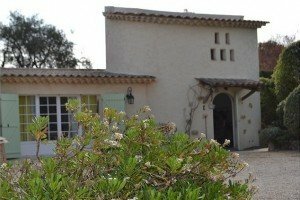 There�s never a dull day on the Cote d�Azur so welcome to Villa Dusett, a wonderful oasis in the center of everything you need and want to experience during Your holiday. The prices is for the whole property with 10 guests. You will always be the only renting party but you have the possibility to rent different houses. I.e. The old house for 4 persons you pay 70 % of the price and if you rent the Round house you pay 60 % of the price. Pls contact info@dusett.fr for price for any combination.